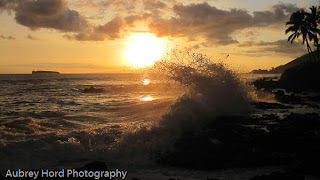 I drove through Wailea to Makena on the south Maui coast to see how big the south swell was this week and I ended up with some great images of the high surf hitting the beaches at sunset. 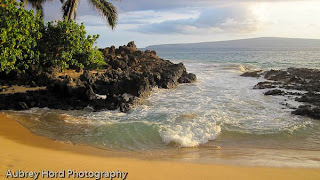 I ended up at Secret Beach or Makena Cove for the shots you see here. It is an idyllic beach for weddings and vow renewals. This night it was a little washed out from the high surf but still stunning! You can see the island crater of Molokini on the left side of the image above. It is a very popular snorkeling and diving site a few miles off the Maui coast. Below you can see the island of Kaho'olawe in the distance and the small cliff side off the left where I set up my camera to capture the waves. It was great to be out with my camera again catching life on Maui!